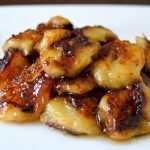 Slice the bananas into coins and sprinkle with coconut sugar on each side. You may end up using about a tablespoon or less. Melt the butter over medium heat and add in the bananas. Cook for 3-5 minutes, until they are golden. Keep a good eye on them, so you don't burn them! Flip the bananas and cook for 1 minute longer. 1. You don't need super ripe bananas to make this. 2. Use this as a dessert topping; it'd go great on some ice cream!